Americans who get their health insurance through their jobs were largely shielded from premium increases yet again this year, a new study has found. That's in stark contrast to the hefty rate hikes found on the Obamacare exchanges. Annual premiums for work-based family coverage increased an average of only 3% to $18,764 in 2017, according to the Kaiser/HRET Survey of Employer-Sponsored Health Benefits released Tuesday. The total cost for single coverage rose an average of 4% to $6,690. Workers paid an average of $5,714 in premiums to cover their families, while companies picked up $13,049. Those with solo coverage shelled out $1,213, on average, while their employers paid $5,477. This is the sixth year of relatively modest increases in job-based premiums. The bump in rates was similar to the increase in workers' wages, which rose 2.3%, and inflation, which ticked up 2%. The cost of health insurance has come into the spotlight in recent years, with Obamacare revealing just how pricey coverage can be. Premiums for the benchmark silver plan on the individual market soared 22% this year for those who don't qualify for federal subsidies. The average silver plan for a 40-year-old cost $4,929, according to Health Pocket, an online health insurance shopping tool. "While the marketplaces seem to get all the attention, the much larger employer market where more than 150 million people get their coverage is very stable," said Drew Altman, CEO of the Kaiser Family Foundation. Employer policies, which cover just over half of non-elderly Americans, have long been considered the gold standard of coverage. Companies take care of the lion's share of the cost. However, this market has not been immune to soaring health care prices. Workers covering their families are shouldering a larger share of the premiums than they had in the past. Their premiums rose 32% from 2012, compared to only 14% for employers, Kaiser found. One reason why workers are paying more for family coverage is because companies often subsidize a smaller slice of their dependents' premiums. This is especially true among firms with fewer than 200 staffers. Also, companies have been hiking deductibles. 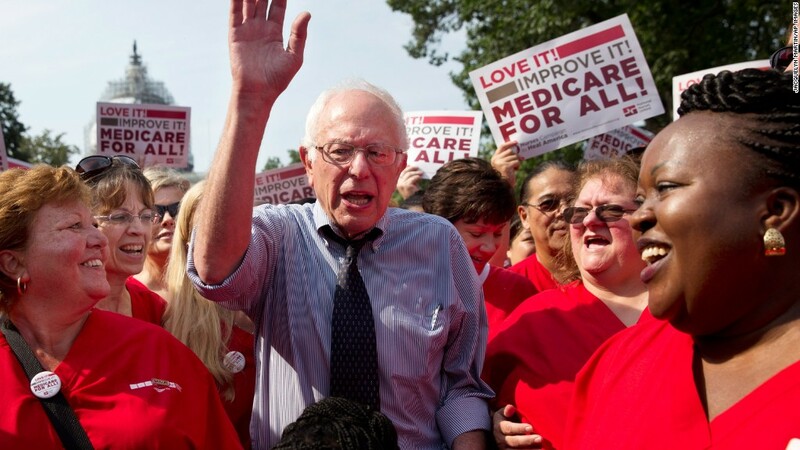 The average deductible for workers with single coverage was $1,505. While that is roughly the same as last year, it is more than double what it was a decade ago. Kaiser doesn't track deductibles for families, which are more variable by employer. 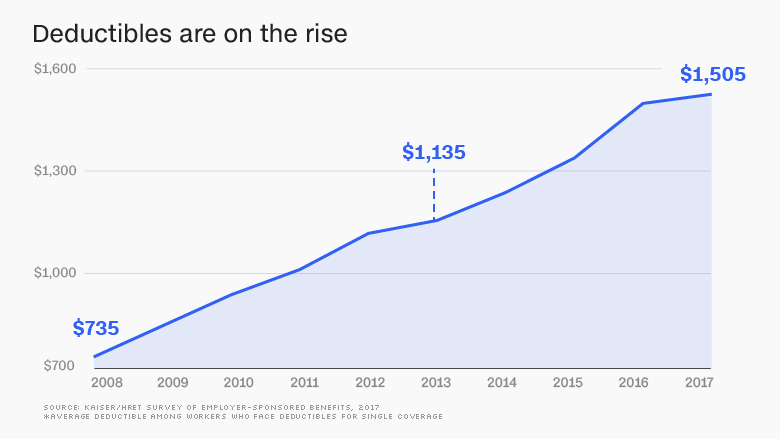 Just over half of workers with single coverage face deductibles of at least $1,000 this year, up from about one-third in 2012. And 11% have deductibles of at least $3,000, up from 6% in 2012. Some 19% of employees are in high-deductible plans with health savings accounts now, up from 6% in 2010. Their annual deductibles are at least $1,300 for single coverage and $2,600 for family plans. Workers are also on the hook for more when they get medical care. The share of workers responsible for at least $3,000 in out-of-pocket costs -- which include deductibles and co-pays -- jumped to 57% this year, up from 38% in 2013. One bright spot, however, is that more companies are placing a limit on how much employees are responsible for. That's because Obamacare instituted a cap on Americans' out-of-pocket expenses -- $7,150 for 2017.